[152 pages Report] The carbon footprint management market is estimated to grow from USD 7.76 Billion in 2016 to USD 12.94 Billion by 2021, at a Compound Annual Growth Rate (CAGR) of 10.8% during the period 2016–2021. The objective of the research study is to provide detailed segmentation of the carbon footprint management market on the basis of type, deployment model, vertical, and region. It also aims to provide information regarding the key factors influencing market growth; strategically analyze subsegments with respect to individual growth trends, future prospects, and contribution to the total market; analyze opportunities in the market for stakeholders; provide strategic profiles of the key players in the market to comprehensively analyze the core competencies; and draw competitive landscape of the market. The base year considered for the study is 2015 and the market size forecast is from 2016 to 2021. The carbon footprint management market value chain includes carbon footprint management software vendors such as Ecova, Enablon, Greenstone+, IHS Markit, processMAP, Thinkstep, and Verisae, while the services vendors for carbon footprint management include Enviance, FirstCarbon Solutions, Schneider Electric SA. “The research study answers several questions for the stakeholders, primarily which market segments to focus in during the next two to five years for prioritizing the efforts and investments”. 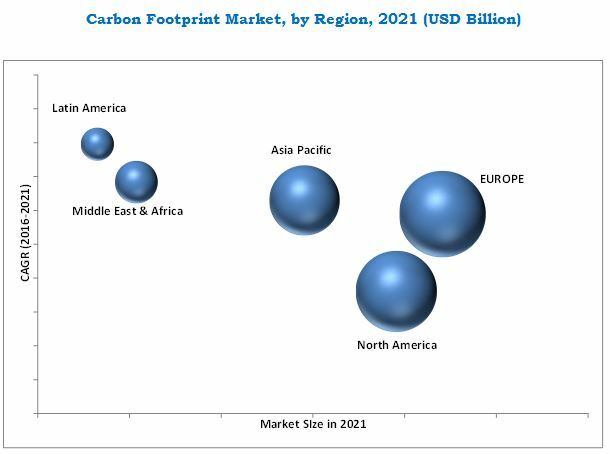 MarketsandMarkets forecasts the carbon footprint management market size to grow from USD 7.76 Billion in 2016 to USD 12.94 Billion by 2021, at a Compound Annual Growth Rate (CAGR) of 10.8%. Mandatory regulations & policies, increasing concern for reducing carbon footprints, rising prices of energy sources, targeting a sustainable future are some of the key factors driving the CFM market. The carbon footprint management market is broadly segmented on the basis of software, service, deployment, vertical, and region. The initial findings about the market depicts that by the end of the forecast period, the carbon footprint management services market is likely to achieve a winning imperative as new and more efficient and specialized carbon management services will be introduced in the market. The deployment market is bifurcated into on-premises and on-demand market. The on-demand segment is expected to account for high growth in the carbon footprint management market as the organizations are more focused on reducing operational cost with improved efficiency. Since the third party vendors offer these services at a reduced cost and manage all the processes from deployment to maintenance, the organizations will be willing to prefer on-demand mode to the on-premises mode. Additionally, the vertical market is bifurcated into telecom and IT, manufacturing, commercial building, utilities and transportation. The commercial building is expected to be the fastest growing market due to the growing need for greener and smart building that emit low carbon, supporting government initiatives for smart cities. The manufacturing sector is expected to account for the largest market share due to growing environmental concern and achieving cost-effectiveness resulting in manufacturing industries taking steps such as setting a set target of reducing carbon emission, implementing renewable energy source and much more. Europe is expected to be the largest contributor to the regional market share by 2021 due to the region being technologically advanced and the increasing spending on energy efficiency, carbon footprint management programs along with regulatory government mandates in the Germany, U.K., and France related to carbon reporting for the enterprises, while Latin America is showing tremendous growth potential in the future due to various government subsidies and benefits for carbon footprint management market, increased foreign investments, rapid industrialization, and major export projects. Lack of standardization, high initial cost of deployment, longer period of return on investment, and lack of specialized & skilled workforces are expected to restrict the market growth. However, these factors are expected to be impactful only for a short period. On a strategic front, many companies are utilizing different growth strategies, such as mergers & acquisitions, partnerships & collaborations, and product developments to increase their share in the market. In February 2016, Verisae, Inc. announced partnership with Cyient, a leader in software-enabled engineering and geographic information system services. Cyient will be a development partner and authorized Value-Added Reseller (VAR) of Verisae, Inc. products globally. This partnership will encourage developing innovative projects such as integrating each other’s offering with existing resources. In the same period, Thinkstep released the latest update to its Lifecycle Inventory (LCI) Data, GaBi Databases 2016 Edition. This product extends coverage to include future energy grid mixes, additional waste water, hazardous & municipal waste, U.S. wood products, EPDs, and a wide range of industry association details. The key innovators in the carbon footprint management market include Schneider Electric SE, Enablon, IHS Markit, Enviance, processMAP, Thinkstep, Verisae, FirstCarbon Solutions, Greenstone+, and Ecova.